Phil Mickelson and Keegan Bradley lose out in dramatic play-off holes at the the Northern Trust Open last night. THE 18TH HOLE at Riviera had given up only six birdies to 73 players in the final round of the Northern Trust Open. Bill Haas convinced himself there would be at least one more to force a play-off. The surprise was how it ended. Two holes after Phil Mickelson and Keegan Bradley poured in birdie putts to set up a three-man playoff, Haas won with a birdie on the 10th hole when all he was trying to do was make par. It was just under 45 feet, all the way across the shallow putting surface, and it provided a stunning conclusion right when thousands of delirious fans — including Jerry West, the tournament’s executive director — thought it couldn’t get any better. “If I hit 30 putts, I maybe make five of them,” Haas said. “But it just so happens it did right there. I hit it just like I wanted. I hit the line. There was a ball mark about 10 feet in front of me. I was trying to go just around that, and I did that. On this day, just about everything did. Haas started the final round two shots behind, making him the fourth consecutive PGA Tour winner rally on Sunday. He holed a 5-foot par putt for a 2-under 69 that looked like a winner when neither Mickelson nor Bradley, who shared the 54-hole lead, birdied the par-5 17th and came to the last hole needing a birdie to keep playing. Haas was on the practice range at 7-under 277 and a one-shot lead, preparing for a playoff that seemed unlikely. What followed were two putts that even impressed West, the Los Angeles Lakers great known as “Mr Clutch,” who was standing with thousands of fans on the hill below the fabled clubhouse at Riviera. Mickelson had missed three straight putts inside 10 feet on the back nine — two for par, one for birdie — and just when it looked as though he had lost all hope, he rammed in a birdie putt just outside 25 feet from off the green, pointed his putter toward the cup and slamming down his fist when it fell for an even-par 71. He bumped fists with Bradley and told him, “Join me.” Bradley, the PGA champion, did just that. His putt from about 12 feet took one last, slow turn and disappeared for a 71. “Even though I didn’t win the tournament, to make that putt on the last hole, one of the toughest holes on the PGA Tour, is really awesome,” Bradley said. They started the playoff at the 18th. Haas was short of the green, 80 feet away, and hit a chip-and-run to 3 feet for par. Mickelson two-putted from 35 feet and Bradley’s 15-footer from just off the back touched the right side of the cup. That took them to the 312-yard 10th hole, considered the best short par four in America, a hole that can make an argument as the most interesting hole in all of golf. Yes, it can be reached with a tee shot, but this hole is all about position no matter what club is in the hand. And no one was in good position. Mickelson came up just short of the bunker, leaving him no angle at the green. As great as he is with the flop shot, a ball that landed near the flag rolled through the green and into the back bunker. Bradley was in the front bunker, and he hit a remarkable shot past the hole that stopped on the fringe about 15 feet away. Haas went over the green, and the angle was just enough that the back bunker was in his way. To try to chip close could have put him in another bunker, so he chose to play away from the flag to make sure he at least could two-putt for par. “I was thinking four could continue,” Haas said. “If Phil holes out of the bunker, or Keegan makes it from off the green, they earned it. They deserve it. Four for me was the goal in the sense that I didn’t want to make five. Haas won for the fourth time in his career, and it was his second straight win in a playoff. And while he was in a tough spot behind the 10th green, it’s not like he hasn’t been there before. Only five months ago, Haas was in a playoff at the Tour Championship with Hunter Mahan with the FedEx Cup and its $10 million prize riding on the outcome. On the second extra hole, his ball was partially submerged in the lake to the left of the 17th green at East Lake, and he splashed out to 3 feet to save par. He won on the next playoff hole. His paycheck Sunday was $1.188 million, yet it felt just as sweet. Email “Watch: Bill Haas goes the extra to win a thriller at Riviera ”. 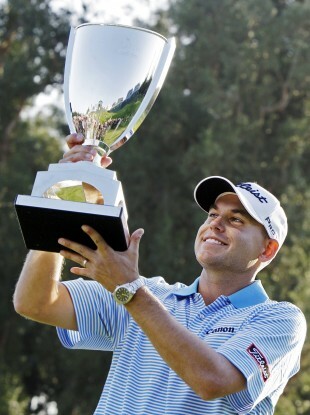 Feedback on “Watch: Bill Haas goes the extra to win a thriller at Riviera ”.